This was one of my most challenging cheesecakes so far, being derived from a combination of Prototype 6 of my pumpkin cheesecake and Prototype 1 of my pecan pie filling (with a little change on the flour). Carefully pour about half of this batter on top of the crust. Bake in tub at 325 degrees for 40 minutes (if using a 9 1/2" pan). 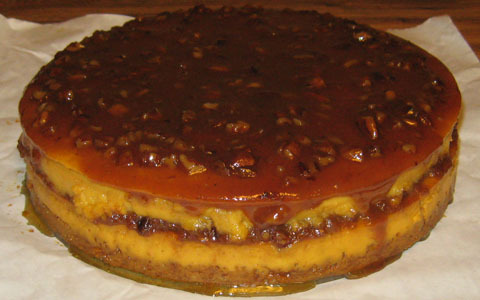 During this phase of the baking, prepare the pecan filling for this cheesecake. Combine all these ingredients in a saucepan before heating. Stir constantly over a roughly medium heat (not high—otherwise the mixture can easily leave a sticky, burnt residue on the bottom of the pan), bringing the mixture to a mild boil. Stir and cook carefully for about another 5 minutes, then remove from heat. Let this mixture sit until it is time to add it to the cheesecake (at which point the filling should still be at least warm enough that it spreads very easily). After the initial 40 minutes of baking, remove the pan-and-tub assembly from the oven and carefully add just enough of the pecan filling to coat the pumpkin batter's surface (close to half of the filling—set aside the rest of it for later, as described below). Next, return the pan-and-tub assembly to the oven and resume baking at 325 degrees for another 20 minutes. Afterwards, take this assembly out of the oven and very carefully scoop the remaining pumpkin batter on top. Then return all this to the oven, with the temperature reduced to 300 degrees, and bake for another 60 minutes. Then cool down with the pan still in the oven (with this oven shut off) and in the tub, with door slightly ajar, for an hour. Afterwards, remove from oven and tub and continue to cool down at room temperature for another two hours, then remove cheesecake from pan and refrigerate. 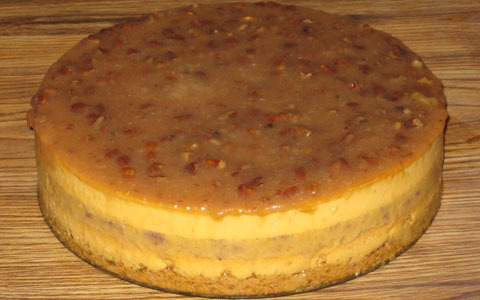 After at least a couple of hours of refrigerating the cheesecake, take the remaining pecan filling, and ensure that it is not too stiff (this can be accomplished by warming it up a little with very low heat). Carefully spread the filling on top of the cheesecake and promptly return all this to the refrigerator, allowing the filling to get more firm (thus reducing its runniness)—at least a few additional hours (or overnight) at this point—before serving this cheesecake. I strove to avoid the pitfall of excessively stiff pecan pie filling, so I did not add any thickener to it. The filling spread easily. On the other hand, it seemed somewhat too runny—the cheesecake ended up being one of my "messiest" ones, with the filling drenching down the side and collecting at the bottom. But this prototype was very tasty, and I got quite a few compliments at Living Hope Church, where this cheesecake was served. It was almost completely gone in about half an hour. Eric—Mary Beth's husband—finished off the last slice not too long afterward. Future options to consider: 1) Just serve the pecan filling on the side (but will too many guests "overtop" with it, wiping it out too soon?) or 2) Add a very small amount of thickener and/or mix some of the cheesecake batter with the early-installment filling (i.e., that which gets baked between the pumpkin batter layers), and—upon adding the remaining filling on top of the refrigerated cheesecake—try to confine this filling more towards the center of the top surface (also, perhaps the baking time should be increased). Okay, let's go primarily with that latter option considered after making the previous prototype! Carefully pour about half of this batter, less 1/2 cup, on top of the crust. Bake in tub at 325 degrees for 40 minutes (if using a 9 1/2" pan). 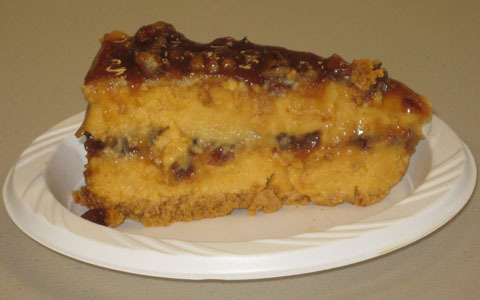 During this phase of the baking, prepare the pecan filling for this cheesecake. After the initial 40 minutes of baking, remove the pan-and-tub assembly from the oven. Mix about half of the pecan filling (set aside the rest of it for later, as described below) and about 1 cup of the remaining pumpkin batter. Carefully add this mixture on top of, and fully coat, the pumpkin batter's surface. Next, return the pan-and-tub assembly to the oven and resume baking at 325 degrees for another 20 minutes. Afterwards, take this assembly out of the oven and very carefully scoop the rest of the pumpkin batter on top. Then return all this to the oven, with the temperature reduced to 300 degrees, and bake for another 60 minutes. Then cool down with the pan still in the oven (with this oven shut off) and in the tub, with door slightly ajar, for an hour. Due to this cheesecake needing to be more stable (see comments below), turn the oven back on, with the temperature set at 300 degrees, and close the oven door. Bake for another 20 minutes (this includes the time for the oven to reach 300). Then shut the oven off and leave the door slightly ajar for 30 minutes. Next, turn the oven on yet again at 300 degrees and bake with the door shut for another 10 minutes (again, this includes the warmup for the oven to get to 300). After this, shut the oven off and leave the door slightly ajar for yet another 20 minutes. Afterwards (at last! ), remove the cheesecake (still in its wrapped springform pan) from the oven and the tub and continue to cool it down at room temperature for another two and a half hours. Then (the foil/wrappers can be removed at this point) take the remaining pecan filling, and ensure that it is not too stiff (this can be accomplished by warming it up a little with very low heat). Carefully spread this filling on top of the cheesecake. Next, with the cheesecake still in its pan, refrigerate until firm (overnight is a helpful suggestion). Remove from pan before serving. Okay, I really did not plan the baking like this in the first place. My original plan was to take the cheesecake out of the oven after that first hour of cooling down with the door ajar. But I noticed that the surface seemed too "jiggly". So I tried to stabilize this cheesecake with some additional cycles of baking and cooldown, making decisions on this matter as I went along. Thus I ended up tacking on another 80 minutes of in-oven time, as indicated above (30 minutes of heating, 50 minutes of cooldown). Then, when I removed the side part of the springform pan, the pecan-pumpkin mixture layer in the middle started to bulge out. So I put the side piece back on for the refrigeration, in hopes of that middle layer getting more firm. That ended up being helpful. But this cheesecake still got somewhat messy upon being sliced. About 1/6 of it was left after being served, among a decent selection of other pastries (plus additional snacks), at Living Hope Church.